Stems: Erect, coarse, fine pubescence on ridges, bushy-branched; branches ascending. Leaves: Alternate, short-stalked, crowded along stem, pinnately trifoliolate; leaflets narrowly wedge-shaped, 2/5 to 4/5 inch long, 1/16 to 1/4 inch wide, gray-green or silvery-silky beneath; tips shallowly notched or truncate with small sharp point; stipules scale-like, up to 2/5 inch long. Inflorescences: Short clusters, 1 to 4 flowered, in upper leaf axils. Flowers: Calyx bell-shaped, 5-lobed, equal to or longer than mature fruit; corolla 1/4 to 2/5 inch long; petals white or creamy-white, base of banner petal purple; wings and keel equal in length; stamens 10, in 2 groups; small self-pollinating flowers that remain closed also common. Fruits: Pods, oblong, less than 1/8 inch long, nearly glabrous or with flattened-hairs, 1-seeded; seeds tiny, smooth, olive to brown, often spotted. Habitat: Low open woodlands, thickets, stream valleys, lake and pond borders, waste places, and roadsides; sandy, clayey, or loamy soils. 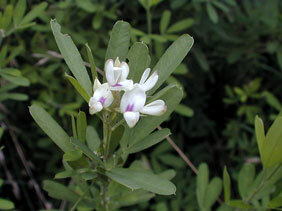 Forage Value: Sheep and goats will consume sericea lespedeza more readily than cattle. Recent experiments with goat grazing have shown some promise in controlling this weed. Comments: Sericea lespedeza is native to eastern Asia. It was often planted for erosion control and wildlife cover but escaped and is now a problem weed that will crowd out more palatable forage plants. Sericea lespedeza has been declared a noxious weed in Kansas.